Daniel and Matthew Wolfe’s music video for The Shoes’ Time to Dance starred Hollywood actor Jake Gyllenhaal as a unaffected serial killer preying on Dalston’s swelling hordes of hipsters. Unsurprisingly the promo went viral and gained them instant notoriety. Their debut feature Catch Me Daddy (2014) is a film that engages in a far more pertinent aspect of contemporary culture, combining British values and Islamic beliefs under a shared canopy of greed and dominant masculinity. Ostensibly a Western set within the rolling Yorkshire dales, the Wolfe brothers’ naturalistic approach is tinged with flashes of alchemy; an abstract fairy tale for a society we’ve become tragically apathetic towards. 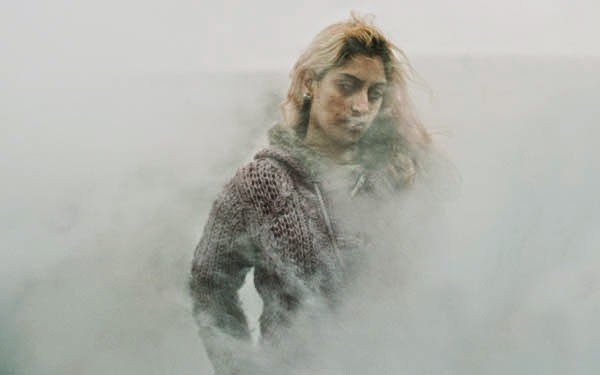 Laila, a pink-haired, woolly cardiganed free-spirit (played with remarkable confidence by newcomer Sameena Jabeen Ahmed) is on the lam, hiding from her strict Pakistani family on the outskirts of a nameless Yorkshire town. She’s joined by her boyfriend Aaron (Conor McCarron) with the pair surviving on odd bits of cash-in-hand work and a dwindling emergency loan. They wile away the hours in their static caravan smoking pot and concocting potent potables out of codeine. However, prowling the horizon are two carloads of men, each scouring the area for hints as to their whereabouts. One contains four British-Asian mercenaries, one of whom is Laila’s brother, the other two are white-British bounty hunters. All six have been hired by Laila’s father to bring her home. Just how, and in what state, remains a mystery in this ambiguous and highly unpredictable thriller. Whilst Catch Me Daddy‘s Western resemblance is unavoidable, with John Ford’s The Searchers (1956) an obvious reference, the film’s fatalistic view of life on the margins of society draws a heavy influence from the lyrical style of the French poetic realist films of the 1930s. The atmosphere of nostalgia and bitterness illuminates the emblematic aspects that fester below the film’s derivative narrative, whilst Robbie Ryan’s breathtaking cinematography augments the long-forgotten remnants of folklore hidden deep within this windswept, ashen landscape. At first glance, the majestic moors, where much of the action unfolds, appear divine; filled with natural beauty, supple hues, and a lingering spirituality that tinges every frame with a touch of mystery. But then the boarded-up shop windows and the seeping rust of static caravans suggest this is a place where the prayers of hopeless dreamers have long gone unanswered. Old-word mysticism and new-world consumerism (most noticeably in a brilliant scene where Laila and Aaron dance uninhibitedly to Patti Smith’s Land Pt. II: Land of a Thousand Dances) are beautifully contrasted against one another, with council flats nestled snuggly in the shadows of rolling hills whilst the film’s enigmatic opening of a Ted Hughes poem read aloud by a young Yorkshire lad exemplify how perfectly calibrated the Wolfes’ debut is at portraying a nation desperately clinging to traditions that have long lost their meaning. However, the skulking menace that constantly threatens to permeate the film’s first half inevitably spirals into violence and it’s here the film’s message becomes clear. By presenting us with two diverse cultures and uniting them with the same goal, the Wolfes have created a succinct depiction of the true ailment at the heart of British society. The Wolfe brothers hardly present Islam in a sympathetic manner, however by holding alleged ‘radical’ beliefs up against traditional Western values, they find very little disparity between the two. Whilst Laila’s father is motivated by cultural and religious traditions, the men he hires highlight a more alarming evil in the world, namely the corruptible power of money. Despite falling into the occasional genre trap, every step of Catch Me Daddy points to a pair of filmmakers unafraid to make brave and interesting choices. By the film’s visceral climax there’s no denying that the Wolfe brothers’ novel approach to social-realism has left a lasting impression, and sees them take their rightful place alongside directors such as Ben Wheatley, Joanna Hogg and Clio Barnard in the current renaissance of daring and inventive British filmmakers.